The video that's posted on the site here of Rob Carson... The one of him playing with SCV... It appears that he was using sticks that had a taper, but no tip. 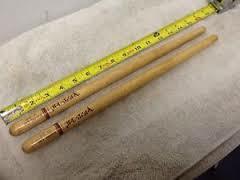 I saw where ProMark made a stick similar to what I'm talking about, but I can no longer find them. Does anyone know if this type of stick is still made and available? Thanks! Promark DC-10's? I looked on Amazon and they're still available there from Promark (D'Addario). Must be old stock since they're discontinued. I think the Pro Mark model you are talking about has been discontinued. I bought a pair about 6 years ago just to see what they were like. I remember them feeling very fast, but I can't imagine ever wanting to use them in a drumline setting (although that's what they are for). I don't remember exactly what I didn't like about them but I think it was a control issue. They also broke almost immediately from me clicking with them. I was bummed they broke because they were kind of fun to play with. I THINK they were marketed as a Matt Savage signature stick to be used for matched grip. I don't know if that's the same kind SCV used. I think they were called DC-10s. I used to have a few pairs back around 85-86 when I first started learning how to play. From what I remember they were kind of short....they weren't elongated to compensate for the lack of bead, but then again my memory is a little fuzzy since it's been so long that I've seen a pair. Yep, the DC-10's were actually Rob Carson sticks, had his name on them. And they were short, I did not like using them with matched grip or solo playing, but not bad with traditional grip line playing. "If rudimental drumming were easy..."
version called the DC-17. Blue Stars and SCV used them (DC-10s). Not sure if anyone else used them or not. Spirit influence started with us in 1979. (Slingerland full length sticks). pair and what happened to that pair? Rick- didn't 27 use them too? I think so, but I used the Carl Rauco stick, which was beadless like the dc-10's but thicker and heavier, made from densiwood. I still have those sticks. Funny thing about the name dc-10's, I used to say "As defective as the plane". There was a commercial aircraft also named DC-10. During the late 70's or early 80's a few of them crashed, raising concerns about the manufacturing of that particular jet. Float made us cut our beads off and we sanded down the edges to create a full length beadless stick. There's also the Promark DC-9, also discontinued.